Campaign posters for Afghanistan's upcoming parliamentary elections are displayed on a Kabul street on September 28. More than 2,500 people, including 418 women, are competing for the 249 seats in Afghanistan's lower house of parliament, the Wolesi Jirga. Banners and posters of the candidates could be seen across the capital Kabul and other cities across the country. The campaign period is set to finish on October 18, according to a spokesman for the Independent Election Commission of Afghanistan, Mirza Mohammad Haqparast. The election is scheduled for October 20. 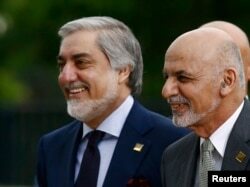 The rival political parties of President Ashraf Ghani and his Chief Executive Officer Abdullah Abdullah are expected to be among the front-runners in the vote. Most parliamentary deputies are seeking reelection. But hundreds of political first-timers -- including the offspring of former warlords and journalists -- are also contesting the vote. The election comes amid increased violence by the Taliban and the extremist group Islamic State, which have been staging frequent attacks across the country. Some 54,000 members of Afghanistan's security forces will be responsible for protecting polling centers on election day. More than 2,000 polling centers will be closed for security reasons. Opposition groups and political parties have demanded biometric machines to be used for transparency and to prevent people from voting more than once. A deputy to Afghanistan’s Independent Election Commission told RFE/RL's Radio Free Afghanistan that so far more than 4,000 biometric machines out of 22,000 sets have been delivered to Afghanistan. Maozollah Dolati said more equipment will be delivered in the coming week. He said the election body will work to deploy the machines in all voting centers. "Afghanistan’s Election Commission will work for the elections to be held transparently and without any fraud, even if for some reason the machines won't be transferred to some of the voting centers," Dolati added.